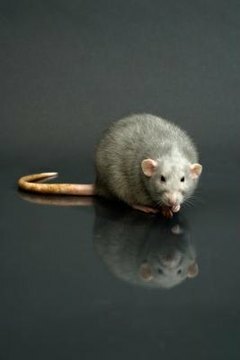 Despite their bad rap as scavengers and horror movie extras, rats make exceptional pets. They are social, they can stand up to handling and they are easy to train. These people-lovers are among the easiest rodents to maintain. With patience and the occasional coveted treat, you can train them to use a litter box. Litter-box training is most effective with young rats, but even adult rats will eventually get the hang of it. A good cage cleaning is the first step. Empty the cage and set aside some of the dirty bedding. Wash the cage thoroughly, rinse it well and dry it completely. You'll need to keep on hand a fresh supply of the bedding you've always used, which will go only in the designated litter tray, and you'll need to introduce a new bedding for all areas outside of the litter tray. Fleece works well. It doesn't produce a lot of dust and is easily laundered. Place the fleece as the main bedding source, and establish where the litter tray will be. If your rat normally uses one corner as her potty, place the litter tray there. Among the varieties of litter trays available at retail, those that you can attach to the cage work best, since your little rodent busybody might be inclined to relocate the tray elsewhere. Fill the tray with clean bedding, the same type you've been using, and place a little bit of dirty bedding on top. This will help your rat recognize that this is where she should be doing her business. Place your rat into the litter tray when you introduce her back into the clean cage. Repeat this process often. If you take her out to play, put her into the litter area each time so she becomes familiar with its presence. If you witness her using the litter area, reward her with one of her favorite treats. Clean her litter tray frequently, no less than every couple of days. Until she's demonstrated that she's really gotten the hang of things, add a little dirty bedding on top of the tray after each cleaning. If your rat is particularly stubborn, try removing all bedding except that in the litter tray area for a few days. Litter-box training has many benefits. It keeps the cage much cleaner, it reduces odor and it's economical. If you allow your rat some playtime outside her cage, such as in a rat playpen, it's possible to train her to use a litter tray on the go, as well. Place the tray in the same corner of the playpen as you do in the cage. If she needs a potty break while at play, you just might find she's done her business exactly where you had hoped she would.